Sunday worship is held at 9:00 a.m. in the large, cathedral-like sanctuary of the Redeemer church. 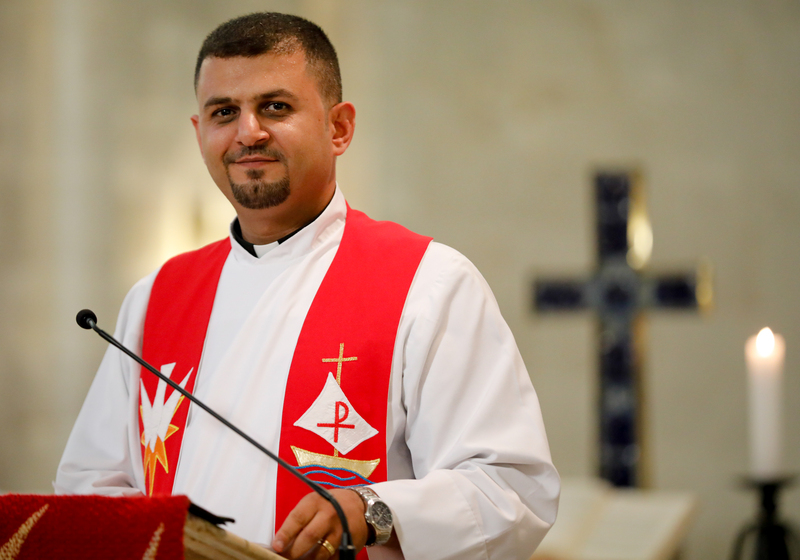 The service is entirely in Arabic, although Pastor Zu’mot will occasionally speak in English or another language to help visitors find the hymns and Scripture texts. Using a formal Lutheran liturgy and hymns in the Arabic language, the congregation sings and participate with energy and the joy. A familiar cadence to the service enables a non-Arabic speaker to recognize, for instance, the Nicene Creed and Lord’s Prayer, and participate in his or her own language. It is an experience recommended for all non-Arabic speakers who visit the Holy Land. Following the worship service, the Arabic-speaking congregation joins with the English-speaking congregation for tea and conversation. The English-speaking worship has been taking place in the St. John’s Chapel of the Redeemer church during at 9 a.m.
During the spring and summer months, the congregation worships one Sunday each month at the Lutheran Church of the Ascension, located adjacent to the Augusta Victoria Hospital on the Lutheran World Federation Jerusalem campus on the Mount of Olives. During the week, church meetings and activities are held at the church center located in the neighborhood of Beit Hanina, a few miles north of the Old City, toward Ramallah. The center is a remodeled house on the main road to Ramallah, a location that is more convenient for many church members than coming into the Old City. Women’s group meetings are held weekly in the center, as are youth groups, children’s activities and administrative meetings. But with a large percentage of the Arabic-speaking Redeemer congregation now living on the far side of the wall, even this location no longer solves the difficulties of coming together as a congregation.